To say I'm into photography is a bit of an overstatement. It causes people to ask what kind of camera I shoot with (see below), followed by when I plan to upgrade to a DSLR (I don't). 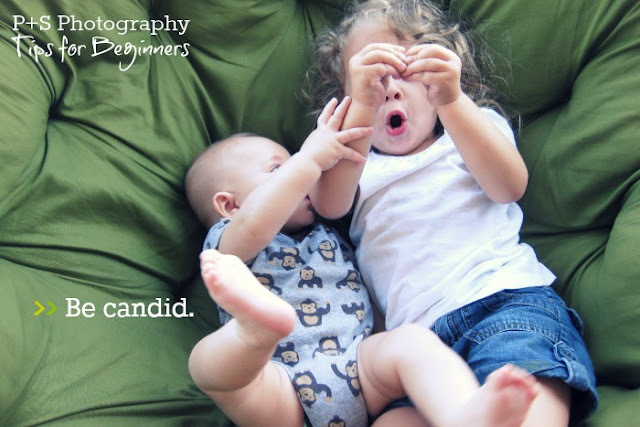 I'm "into photography" because I'm a blogger and our family's photographer. I appreciate quality images and care about improving my own to share on this blog and to preserve for my kids. Can you relate to being "into photographs" but not being a photographer? If you have a point-and-shoot (P+S) camera (film, digital or phone), and care about taking quality photos for your online business, blog, or family photo album: You are a photographer. Start acting like one and get the most out of your snapshots, however you choose to use them--no expensive camera needed. *affiliate links used below. see full note at bottom of page. The point-and-shoot cameras I have used and been happy with include various models of the Canon Powershot (my fav), a refurbished Nikon Coolpix, and most recently my smart phone--specifically the Nokia Lumia which I chose for it's picture quality and affordability. 1 | Turn off the flash. The #1 key to a quality photo is natural lighting. And I'm not talking about direct sunlight (which has issues all its own). 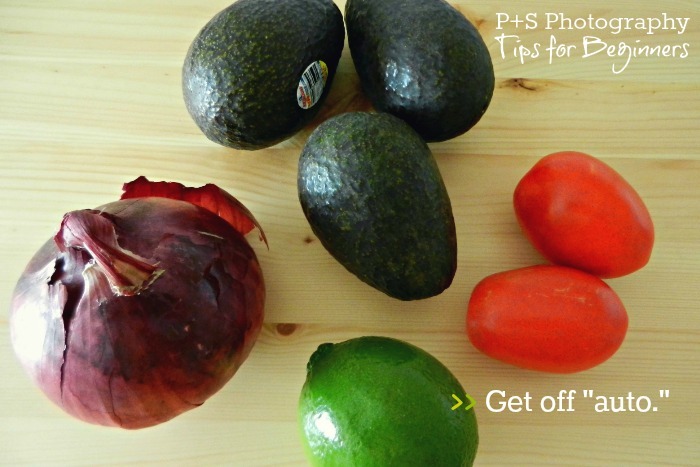 Take photos during the day when you can turn off your flash and turn off that yellow hue from your household lamps. Open the blinds or change locations to follow the natural light. The next trick is steadying your camera to keep the photo in focus (might be difficult if the natural lighting is too low). But, seriously, natural light can instantly improve your photos. 2 | Snap several photos. Please, don't snap one photo and think you got it. My husband hates taking multiple pictures, but this is what gets a really good photo. My magic number is at least 3. But that's after taking a couple quick shots to see what I think of the lighting, angle, background, etc. If this sounds like a lot of work: It isn't. 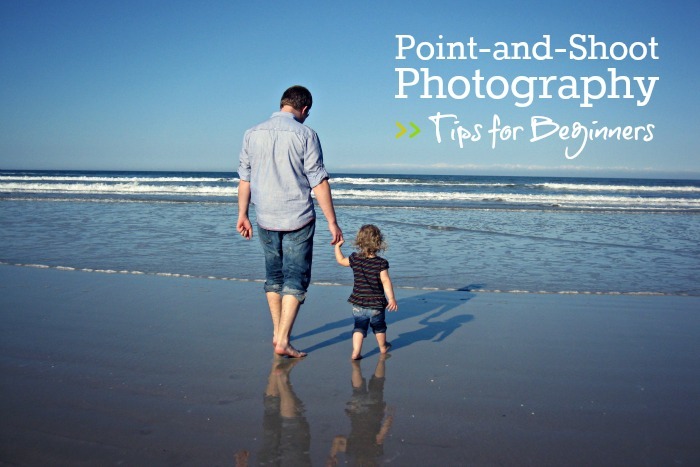 But, don't pull out your camera for pictures unless you're ready to be serious about capturing a good photo. It's too easy to snap a photo from wherever you're standing--which shows in the final photo. Get up high and take a photo looking down on the subject, or sit on the ground and look up, or look head on. Mix it up and see what you think. I've had my share of feeling dumb getting in odd positions with a P+S camera--like I think I'm a photographer or something. But if I get the photo I wanted, it's worth it. 4 | Zoom optically, if needed. I almost never zoom. It's better to get up close and frame how I want--it's usually easier to focus that way and makes a clearer picture. The one exception was when there was a bear outside my parents' cabin. It was pretty close, but I wasn't ready to run up to it get it perfectly framed in my camera. So, instead, I zoomed. All 18x that my camera can zoom optically. And, with direct sunlight, the photo actually turned out pretty good. 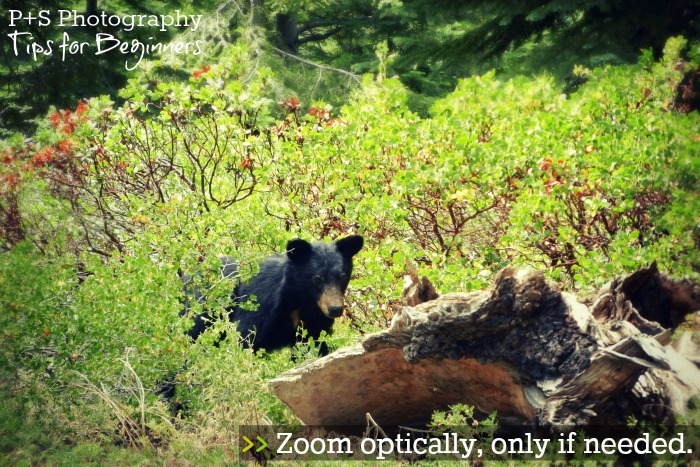 If you must zoom, do so optically. Once you get into digital zoom, it just doesn't turn out the same. 5 | Stage your photo. Posing isn't all bad. It gets the setting and details closer to how you want. 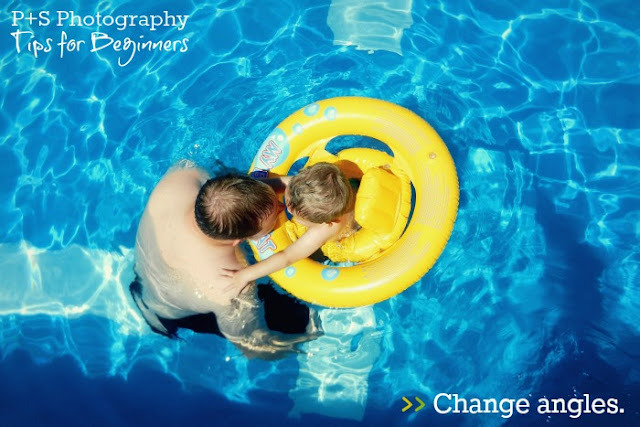 As long as you're sticking with what's normal for your family, posed and planned pictures can come across as candid yet show a little better side of your family than the one with stained tees and a clothes-covered living room. 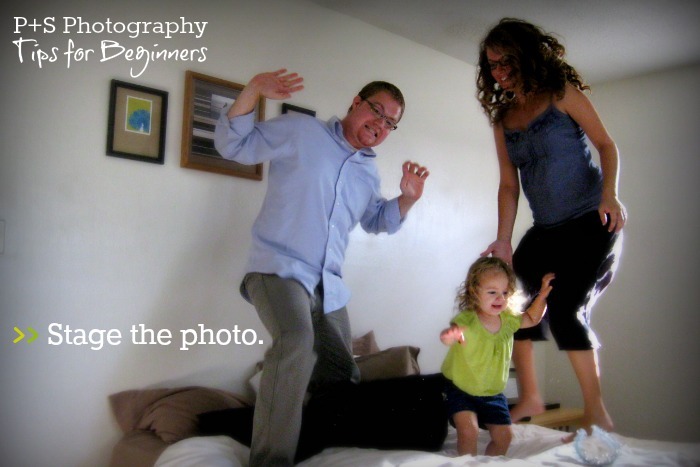 When I was pregnant, Brylee loved jumping on the bed, so I thought our family jumping on the bed would be a fun maternity shot. I didn't over control the setting, but I certainly had in mind what I wanted and staged it, and love what came of it. Are all of your photos of people posing and smiling at the camera? Maybe it's time to try some candid snapshots. When your kids are quietly playing, Grandma is reading to them, or they're playing in the pool. Hang out a few minutes (so everyone gets their posing out of the way), then start snapping away when they return to life as usual. Candid doesn't always work out. But, sometimes, you'll capture the moment. 7 | Use timer for self-portraits. Self-timer is one of the few ways I make it into everyday family photos. The plus side is that we tend to look a little more natural when there's no one behind the camera. 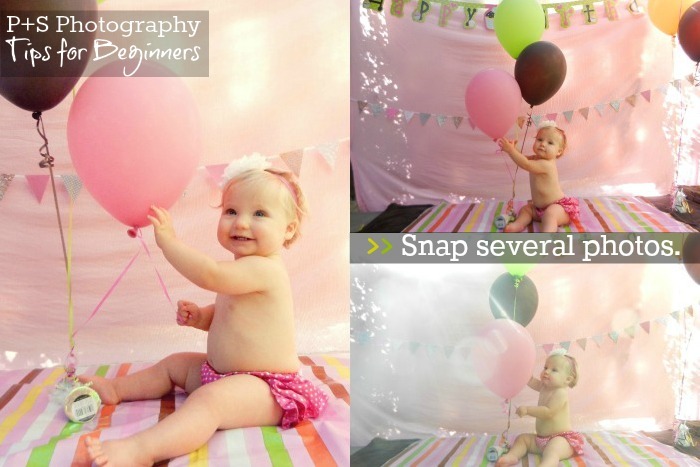 Our Canon had the option of taking 3 photos at a time--great option! My current Nikon only takes one at a time, which can get a little tedious. But it's still worth it if it helps me capture the moment when no one is around to take the picture. 8 | Don't say "cheese!" 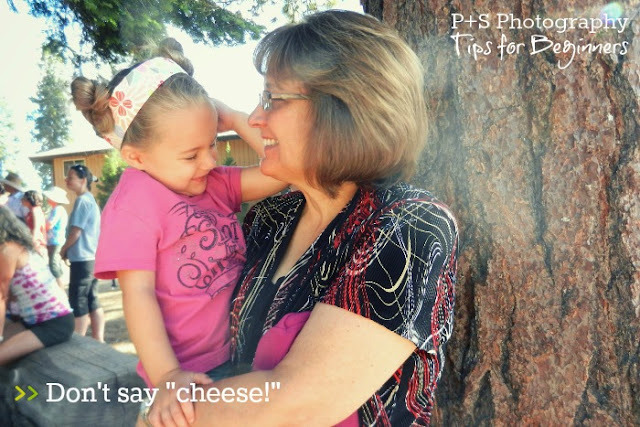 Oh, yeah, and don't tell people to "say cheese." Especially not kids. It's probably the worst way to get a kid to smile. This >> post has some great ideas on getting natural shots from kids. Some of them would work on adults too--although us adults are often set in our cheesy ways. When I'm not able to get a natural smile out of Brylee, her serious looks come out better than her awkward cheeses. 9 | Get off "auto." Learn your camera's settings and stop using "auto." This is what most of us use because it's quick and easy. After learning a couple basic photo settings, I've realized auto rarely gives me the best photos. It's best guess at my light + speed needs are often not good enough. If you can, dive into the manual and learn what your camera can do (I bet it does a lot!). At a minimum, learn a couple settings (portrait, macro, landscape or sport/kids might be good places to start) and when to use them. 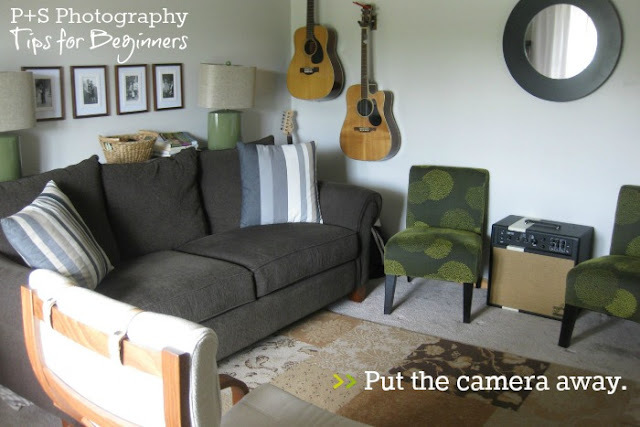 The quality of your photos will greatly improve. My camera has a food setting that works like a charm. 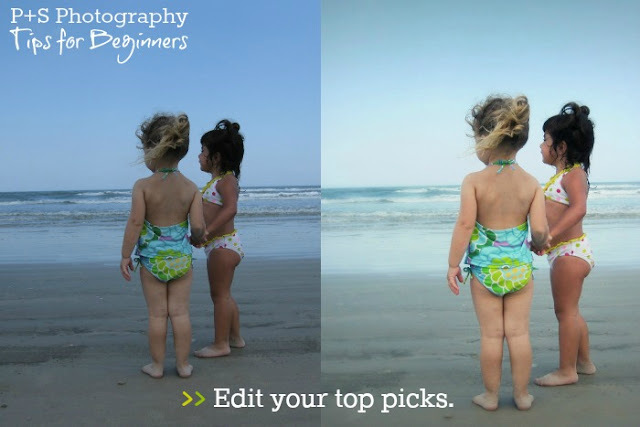 10 | Edit your top picks. 11 | Put the camera away. 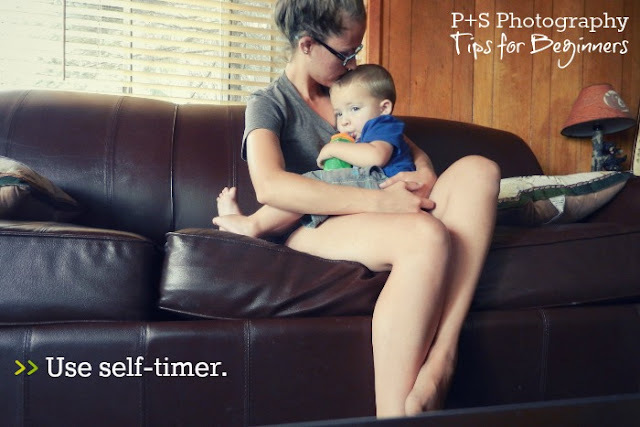 No amount of picture-taking will freeze time or bring back your sweet baby's cuddles. The memory of them sure is nice, but even better is enjoying them in the moment. Put your camera away and live your life. Breathe in the smell of your freshly bathed cutie, feel the veins on your loves hands, taste that delicious slurp of smoothie, enjoy a break from your online business. No picture can measure up to what life is offering in this moment. *Affiliate links used. Purchases made through these links could earn me a small commission with no extra cost to you. Thank you.